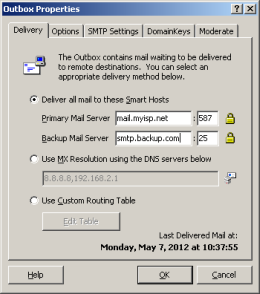 This tab appears on the Outbox Properties dialog and is used to describe the remote and backup mail servers to which outbound mail is delivered by default if Static Routing Table rules have not been configured or if the mail cannot be delivered to the mail host(s) specified in those routes. Messages to local users (mailboxes created on your Mailtraq) are routed direct to the user's mailbox. They do not pass through the Outbox. Mailtraq uses the Domain and Domain Alias settings at Options | Server to determine which domains are local, so it is important that correctly reflects your domain. Messages that are determined as local but for which there is no user-mailbox will follow the Undelivered mail rule. Mailtraq will send outgoing messages by direct delivery using MX Resolution on Port 25 direct to the recipient's mail server. This is the most efficient and secure way to send email messages. No additional configuration is required. Some ISPs limit the use of Port 25 to prevent MX Resolution on some types of account - in which case Mailtraq allows you to send mail to your ISP's mail server - also known as its 'SmartHost' - on the Port, sometimes 587, they specify. See Configuration Tip below. Mailtraq also allows you to configure Custom Routes, so that you can send some messages via one route and other messages via another. Enter the host name of the remote mail server into the edit box, for example: mail.myisp.net The correct value for this service is provided by your ISP. An IP address may be specified instead of a host name but it is not usual practice. Mailtraq will attempt connections to remote mail servers on port 25 by default. use the same SMTP settings here. If another port must be used then you should enter that port number in the box provided. (For older dialog see below). Enter the name of the backup mail server into the edit box. Note: The backup mail server has the same requirements as the Primary Domain Server defined above. s erver by 'looking up' (resolving) their MX records. The DNS server(s) listed are automatically detected by the mail server from the DNS server entered in the machine's NIC (network card). Options | Server | Lan-tab dialog (as shown). Which DNS servers should I use? You can use Google's Public DNS servers, the ones recommended by your ISP or choose your own. These free software packages: DNS Benchmark or Namebench - can analyze the best DNS responding servers for your location. Mail doesn't get delivered - how do I solve this? Solving outgoing mail problems is explained in this FAQ - Mail will not send out. Older Mailtraq consoles do not allow direct entry of non-standard ports. All non standard configuration must be done using a Custom Route. Some ISPs require you to use a 'secure' or 'non-standard' port when using their smarthost: Port 587 is common. As you cannot enter a specific port into the simple dialog box shown above - you need to use the Custom Routing Table which gives you advanced control over how mail is sent. Below are the simple setting adjustments you will need to make to set a specific port for the SMTP smarthost. If your ISP also requires Authentication you can add the username and password at the small padlock symbol. and [OK] back to the Console. The route will become active when the Outbound Router becomes idle.